Precautions must be taken when installing a child seat with a stay (or drop down leg). 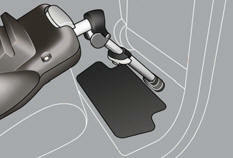 In particular, take care when there is a storage compartment present in the rear footwells. Do not place the stay on the storage compartment cover, it could break in a serious impact. 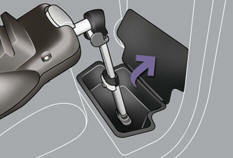 Where the range of adjustment for the stay allows, we suggest two other possibilities for installation. If the stay is long enough, you can place it in contact with the bottom of the storage compartment. Remove all objects before installing the stay. One other possibility, where the stay is long enough and can be inclined sufficiently (while observing the recommendations in the fitting instructions for the child seat), is to position the stay so that it is in contact with the floor away from the storage compartment. Remember to use the adjustment of the seat position to obtain a satisfactory position for the stay which is away from the storage compartment. If you cannot fi t the stay in the way described, we recommend that you do not fi t a child seat with a stay in this position.